So maybe he wasn't "helping" per se. But he sure thought he was being helpful. He's into unpacking things lately. Like for instance, he dumped out ALL of his legos this afternoon all over the livingroom floor just before we were about to leave for my Stroller Strides class that I teach. And then he "unpacked" the tub with all his toys and washcloth and even a few cupfuls of water (that is, until I figured out his plan to put EVERYTHING outside the tub and took his water-dumping device away). And how he takes all his books each night before bed and methodically places them all around himself on the floor next to his bookshelf. Yeah, I definitely see a trend here. And as annoying as it can be, I keep reminding me that one day I'll look back at this phase and miss it. And I try to enjoy each of his little milestones, and appreciate them.... All while I pick up each and every lego/outfit/bathtoy. Yup. And here he is with his darling blankie. He really hates to brush his teeth (any ideas out there on how to make him more agreeable? Our pediatrician really thinks we need to push this issue before his mouth rots and he whithers away apparently...), but he loves to chew on his blankie. Makes us kind of happy when we see him do it because it rubs against his teeth and maybe, just maybe, does some "brushing" of it's own for us. We are wishfully thinking so, at least. Awww, what a cutie! 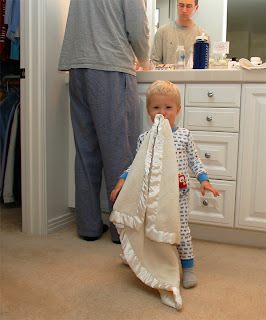 I think my son has the same blankie. Does Dylan like to just chew on the brush? That's what Katie does, mostly. I would just re-introduce the brush as a toy for now, not forcing him to actually brush - just get him to like chewing on it, etc. Then eventually add the toothpaste. Down the road you could limit when he brushes, but we generally let Katie brush anytime she runs into the bathroom and says "brush teeth." I'd rather let her think it's a treat than a chore. I second rob's advice. My kids were introduced to toothbrushes as teethers!